Steve Bannon and Reince Priebus want everyone to know everything between them is all good. 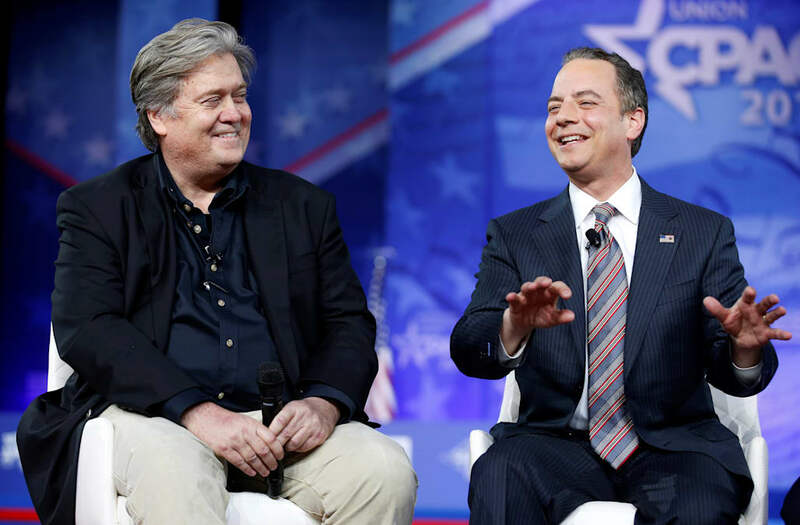 President Donald Trump's chief strategist and his chief of staff sat down together for a rare joint appearance Thursday at the Conservative Political Action Conference in Maryland, where they aimed to get across that point during a 25-minute discussion. Interviewed by the American Conservative Union president, Matt Schlapp, the two attempted to shut down reports of discord between them while painting the news media, as Bannon repeatedly called it, as "the opposition party." The two gave off a friendly vibe onstage, with Priebus even gently touching Bannon's arm one point. Priebus joked that he "love[s] how many collars [Bannon] wears," poking at the chief strategist's somewhat unique style sense, while Bannon complemented the chief of staff as a hard worker and later admitted that he himself "runs a little hot" on occasion. Asked about the biggest misconceptions about the Trump White House, touching on reports of tension between the two administration leaders, Priebus said "everything" was misreported. "I think the biggest misconception is everything that you're reading," he told Schlapp. "If you look at how the opposition party portrayed" Trump during his candidacy, as president-elect, and as president, "it's all wrong." A number of reports have surfaced since Trump's election win that have painted a picture of a split within the White House between staffers loyal to Bannon and others loyal to Priebus. Recently, after Michael Flynn resigned as national security adviser following a bombshell report about his communications with Russian officials regarding sanctions, major Trump-backing sites such as Breitbart News and InfoWars painted Priebus as the source of leaks coming from the White House. Bannon, who joined Trump's campaign in August after leading the Breitbart news operation, criticized Breitbart's story on the subject. On Thursday, Bannon said the media was weeping on November 8 when Democratic presidential nominee Hillary Clinton lost to Trump. "If you think [the media is] going to give you your country back without a fight, you're sadly mistaken," he later said, adding that the news media is "corporatist" and "globalist" and opposed to Trump's "economic nationalist" agenda. He said the major planks of the Trump agenda include a focus on national security and "sovereignty," economic nationalism, which includes trade reform, and a deconstruction of "the administrative state." "Hold us accountable for delivering what we promised," Bannon told the crowd.